I know I JUST wrote a post about how we feel bad when we eat things that aren’t homemade, but I wanted to be sure I wasn’t scaremongering. No matter where you live, there are some wholesome choices you can make outside the home. You can find restaurants with sustainable, fresh, local ingredients, who do not use chemical-laden products because the real thing is so much better, and who care about your specific dietary restrictions or concerns. There are restaurant kitchens you can learn to trust nearly as much as your own. This post isn’t about them. This post is about pizza. You’re groaning now, but you know you’ll tell someone later. Anyway, I sorely miss good pizza (and even bad pizza). I haven’t yet perfected a gluten-free pizza dough myself. A lot of pre-made bases are chewy, and I never remember that I need an extra hour before baking for boxed doughs to proof. The frozen pizzas offered in the Tesco and Sainsbury’s shops here vary wildly, and, when I found one I really liked, it disappeared forever. What’s a gluten-free girl to do?! CB: Do you offer your gluten-free pizzas yet? Dominos employee 1: I don’t know what that is. I’ll get the manager. Dominos manager 1: We did have gluten-free bases, but nobody ordered them. We binned them. CB: You binned them? You didn’t even advertise them. It wasn’t on your menu. Dominos manager 1: You can call another branch and see if they have them still. Tell them I told you to call over. CB: Do you offer your gluten-free pizzas yet? One of the other branch managers told me to phone over to you. Dominos employee 2: I don’t know what that is. The manager isn’t in, but I’ll phone him and have him phone you back. Dominos manager 2: I’m not sure if we have them. What is gluten? CB: In short, gluten is something that’s in wheat and other grains that some people are allergic to. Dominos manager 2: Really? Can you tell me more about it? What does it do? Dominos manager 2: Wow. Thanks. I’ve never heard of that. We don’t have anything gluten-free, I don’t think. While the employees and managers were really nice, they had no idea what was going on (and I have to assume the bit about having binned them was a panic-driven fabrication). At that point, I wasn’t even so bothered they didn’t have the bases — I was prepared for that possibility since it was only rolling out — but I was very concerned by the fact that the information was so sparse and different. They clearly had not be trained about gluten cross-contamination if one of the managers didn’t even know what gluten is. As you may know, I like to have my voice heard. I got in contact with the national Dominos folks and discussed the issues we discovered in the Belfast branches. After a bit of back and forth, we agreed that it was best they pushed the roll-out date back a few weeks and work on employee education. I was later offered a voucher for my assistance and trouble and to try the new pizza when it came out and give feedback. A few weeks later, voucher in hand, I tread onto the Dominos website. There is a big GF on the choice of bases. There are comments about which toppings are not gluten-free, which, it is good to see, are very few. I double- and triple-check everything before I place the order. I half-expect the phone to ring, and they will tell me they still don’t have them in Belfast. Not even three minutes later, an unknown number calls. I answer. Dominos employee: You ordered a gluten-free pizza? Me: (sighing) Yes, I did. Dominos employee: I just wanted you to know there is egg in the base. Some people are allergic to eggs, and I wanted to make sure that was okay. Me: Absolutely. Thank you so much for asking. What a difference. Less than a month prior, no one in the shops even knew what food allergies were. Now they’re phoning to make sure I’m not allergic to eggs?! How wonderful! The delivery driver explained that they always make sure the pizza boxes marked with a gluten-free sticker sit on top of the others, just in case something could fall down into it somehow. 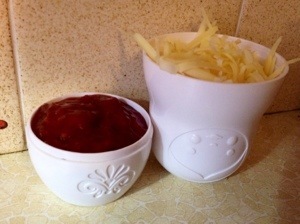 Some drivers choose to leave off the dips because they aren’t sure about the content and don’t want to give out something that might have gluten (They don’t; I checked). I was overwhelmed by the allergy-attentive service by a take-away pizza chain! 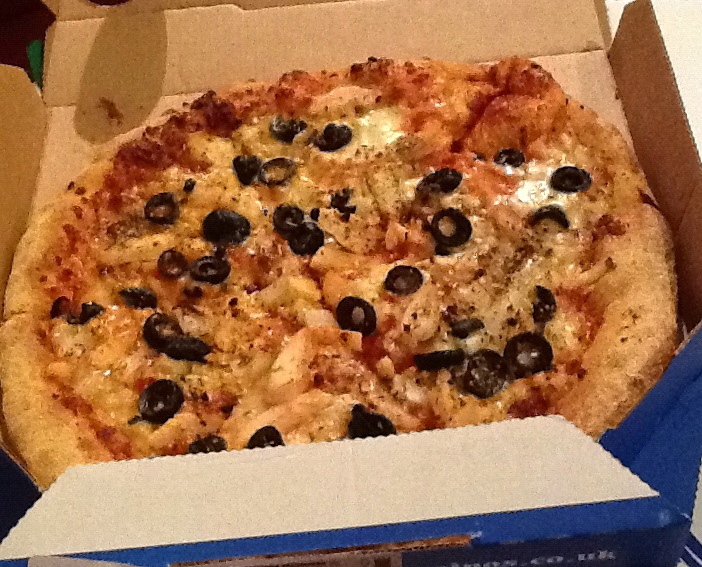 The Dominos pizza is good and tasty, but it’s not fantastic. It relies a lot on corn, which results in a heavier crust than their usual fare. It is crispy, which is a big problem with gluten-free doughs, and it isn’t too chewy. It only comes in one size (9″), but, in all, it makes for a good indulgent take-away, especially since they added spinach back to the toppings choices! The next hurdle I see for them is understanding that, because of some recent recipe changes, not a single side item or dessert is gluten-free. Currently, the only gluten-free option is the pizza itself. Only a few weeks ago, Pizza Express announced their new gluten-free range (It’s even on the main page of their website!). After doing my research on how they are meant to be trained for cross-contamination (and knowing that I expect a little more from them than I would from Dominos), we decided to give them a try. The menu clearly marks items which have “NGCI”: Non-Gluten-Containing Ingredients. There aren’t a ton of options, but there are a few starters (including a lovely white wine and butternut squash risotto), at least one dessert, and a beer. (Their extensive online allergen menu (PDF) makes suggestions on how to make other items suitable for X allergy.) Nearly all of their pizzas can be made on the gluten-free base without any topping adjustments. The service astounded me. I always fear the worst when someone questions the gluten-free thing. Server: Oh, are you gluten-free? Server: I will alert the kitchen. Rather than being made to feel a picky eater, she let me know with that simple statement that my dietary needs would be taken seriously. One table over, I heard the same server discussing with the mother of a young Celiac girl the changes the company had made in every kitchen for the gluten-free range. They have a completely new and gluten-free portion of every kitchen. Nothing ever goes on that side that has touched the other foods. They have a new oven that is only for gluten-free pizzas. In the cases where they are forced to utilize the same shelf space, the gluten-free items are all on higher shelves so that no errant flour can fall onto them. They are clear when they deliver the pizzas to the table which is gluten-free, but the setting is just the same — it sounds like such a little thing, but, when something is obviously different from others, it draws attention to it when you’d rather just get on with eating. Pizza Express does have a superior crust. I would expect that. They have quality ingredients with responsible sources. The crust looks and tastes like a regular pizza crust. I’m shocked to say that I almost forgot I was eating a gluten-free pizza. Every once in a while, if I let my mind wander while eating, I’ll come back to the meal with a sudden paranoia that I have made a massive mistake and WHAT HAVE I EATEN?! That panic lasted a second longer when I realised there was pizza in my hand and it looked so good. 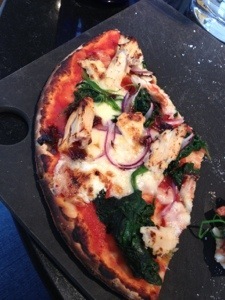 REAL pizza from Pizza Express! Pizzas from Dominos and Pizza Express lead completely divergent existences in the pizza world. Though Dominos did stumble at the beginning, eventually both chains impressed me. I can’t expect for any employee or company to know everything straight out of the gate, but a true willingness to learn and a commitment to respect go a long way in my book. There is a new favourite in our household, and it goes by the name of Tiny Tacos. 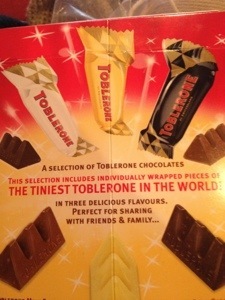 It has been long-established that a sure-fire way to market any product to me is to make it smaller. You wouldn’t believe the little knick-knacks I have just because they’re small and adorable. I used to make paper cranes out of Starburst wrappers; then, I realised I could use the scrap from it (cut off to leave the wrapper square) to make even tinier ones. The smallest I got was just under 1cm tall. I’m a bit mental. I bought these. I don’t need them. They’re tiny. Regardless, Tiny Tacos are very tasty, and they are reasonably quick to throw together. I’m in the home stretch of essay-grading, but every moment spent away from the red pen feels like it needs to be justified. We’re also nearly a week through the Love Your Greens Challenge, and it has made a truly exciting addition to our diets. While Tiny Tacos aren’t exactly bad for you, they’re not the best healthy food, either, so the green smoothies have made me feel less guilty about putting these things on a plate. If you’re at a loss for how to celebrate Cinco de Mayo today, knock out some easy Tiny Tacos and feel very fake-Mexican, indeed. I think I could successfully market these things to myself. * If you have a taco seasoning mix or packet that you like, go for it instead of the spices listed here. I prefer to make my own spice mixes, but I am well aware that not everyone does. Preheat oven to 350°F/175°C. Crush enough tortilla chips to cover the bottom of your casserole dish. You don’t want to put too many because they will get soggy; the idea is to form a bit of a crust, not to have a crunchy bottom. 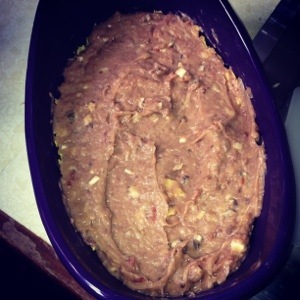 In the saucepan, stir together the refried beans, 1 cup of cheese, and the salsa. Warm over medium heat, stirring occasionally to prevent it sticking and burning (as there is very little liquid). When warmed through, stir in the chopped coriander/cilantro and spread across the tortilla chip base in your casserole dish. Smooth with the spatula. After spreading the bean mixture, put the olive oil, cumin, paprika, black pepper, cayenne, and garlic in the pan. Heat the pan over medium heat to infuse a bit of the spices into the oil. Add the diced chicken and completely coat with the oil mixture. Cook until done, at least five minutes depending on the size of your chicken bites. Add the chicken evenly on top of the beans in the casserole dish. Top with remaining cheese and chopped olives. Bake for about 10 minutes — everything that needs to be cooked is already cooked. You just want to make sure everything is warm and the cheese is melted. 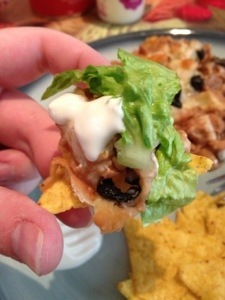 If you have thick handmade or handmade-style tortilla chips, you can toss the toppings (sour cream and lettuce) right on and eat it like a dip. Our chips were not so sturdy, so I scooped each bite onto a chip with a fork and topped it like I would a taco. After all, they are Tiny Tacos. Sometimes I’m so selfless, I make food for people I can’t even eat! Now that I’m truly getting better from my surgery, I’m trying to do more things when I’m not grading essays. 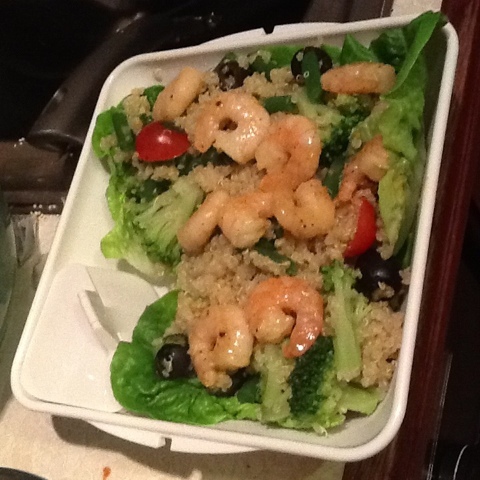 This week, I made a lunch (and dinner) for CB that had prawns — a food I am VERY allergic to — but was actually gluten-free. I made myself a dinner out of the non-prawny leftovers with a wee bit of chicken cooked with the same flavours but with olive oil instead of the butter. I’m pretty sure this would be tasty without any meat if you amp up the veggies a bit more. Any veggies could go well with it, I think. If you substituted the butter, you could even make it vegan! Pour the quinoa into the mesh strainer and rinse under water for about two minutes, rubbing the grains within your fingers. This step is important because quinoa can taste bitter and woody if you don’t remove the natural outer coating. Some quinoa comes pre-scrubbed, but I still give it a go-over. In a decent-sized pot, melt enough butter to coat the bottom. Toss in the quinoa and stir vigorously until you get a nutty scent. If, like me, you have spent most of your life nasally-impaired, this takes about 45 seconds to a minute. Pour the water over the quinoa and stir. 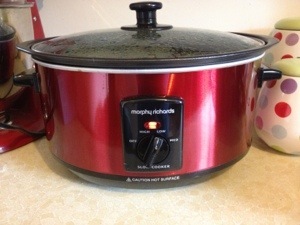 When the water begins to boil, cover and simmer for 15 minutes. If there is still water in the pan, re-cover and let it continue to simmer until all the water evaporates. Turn off the heat and let it stand uncovered for five minutes. Dump it into the mixing bowl and fluff with a fork. Boil water in another pot with a bit of sea salt. Chop broccoli into bite-sized pieces. I cooked the broccoli and the green beans together because, well, I don’t see why not. 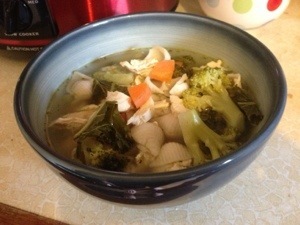 Cook to your desired consistency, drain, and dunk immediately in a bowl of cold water for a minute or so. Cut the green beans into manageable pieces. Drop it and the broccoli into the mixing bowl with the quinoa. Cut the olives in half and toss in the quinoa. Chop the coriander roughly (I used herb scissors I got as a wedding present that made me feel very special indeed) into the mix. Toss it all together until it is well-mixed. Ok, I tried to get a little fancy with the tomatoes. I cut them in half and put them in a very hot, heavy-bottomed pan — NOT flat side down. If you put them flat side down, the heat will pull the seeds out and get gunky. But, the magic is, if you leave them down on one round part and leave them there for a couple of minutes, they will char on that side and create a sweetness throughout the whole bite. Just make sure to remove them before they start smoking and dump them in the mixing bowl. Now for the prawns! I don’t generally cook things I’m allergic to, so I’m glad these came out as well as they did. I put a fair amount of butter in a pan — more than I thought was needed, actually. Toss in the garlic powder, chili flakes, and black pepper. Squeeze half the lime (don’t worry about trying too hard) into the butter and spice mixture and stir it all around. When it’s nice and bubbly and coating the entire pan surface — and then some! — place the prawns in one at a time. I like to place them into the pan clockwise, so I know what order to flip them. After about 30 seconds, swirl the pan around. After another 30 seconds, flip them over. Do the same again. Obviously, if you have uncooked prawns to started, you’re going to need to cook them more. I have no idea about that. Place the lettuce leaves out on a plate. Spoon the quinoa mixture on top of them. Place the prawns on top. Offer up lime wedges for an extra tang. Here is CB’s lunch box for Monday. 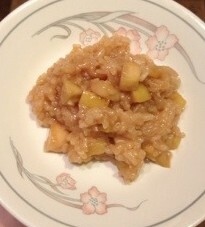 It may not look like it, but there was a TON of quinoa packed in there (and a lime wedge in the wee box).